Why people buy Android phones vs. Apple iPhone. And why Android phones are abandoned quickly. Apple’s way of getting you to buy a new phone is to make you really happy with your current one, whereas apparently Android phone makers think they can get you to buy a new phone by making you really unhappy with your current one. 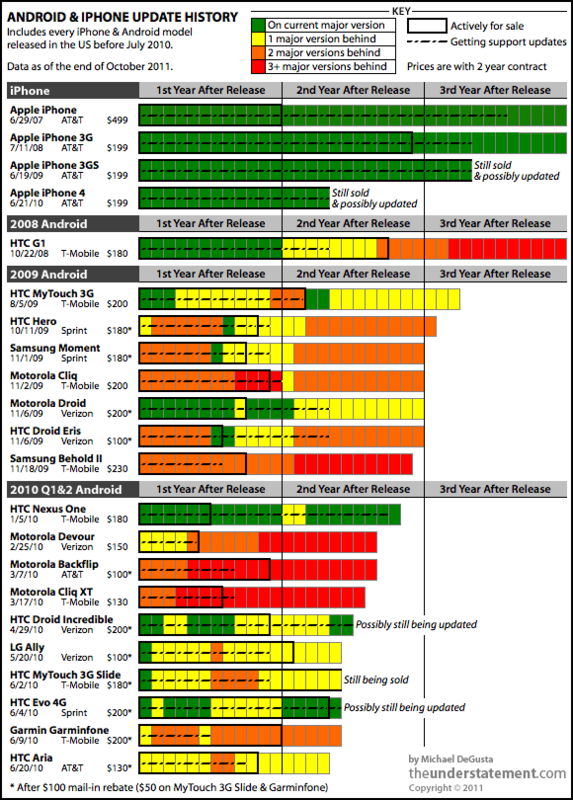 So the “low cost” phones that fueled Android’s generally accepted price advantage in this period were basically either (a) cheaper from the outset, and ergo likely outdated & terribly supported or (b) purchased later in the phone’s lifecycle, and ergo likely outdated & terribly supported. Just one of the many reasons that the Apple iPhone customer satisfaction leads smartphone industry . This entry was posted on Thursday, October 27th, 2011 at 2:23 pm	and is filed under iPhone. You can follow any responses to this entry through the RSS 2.0 feed. The reason I mention that is the HTC EVO 4G shows updates, but that was launched as a high end Android device. I’m curious if support is something the OEMs are only doing for the high price/margin devices and leaving the cheapies to die early. Samsung Galaxy S II is introduced this year so it’s currently supported, but judging from Samsung’s other phones, S2 won’t be supported for long. 2.3.5 is the latest version 2.x, and 4.0 was announced recently (3.x isn’t for phones). They are behind. For me, buying an Android phone is like paying someone to give you a big, fat headache! It’s a bag of hurt, all the way around. Yup. Android provides no value to people who want to get things done.